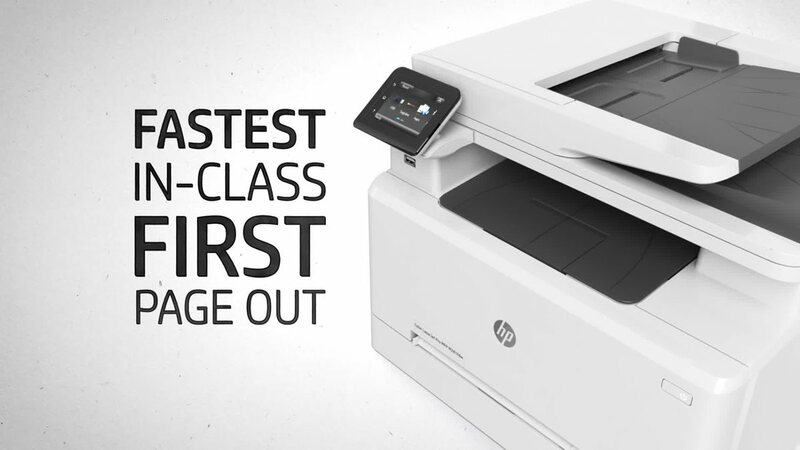 Count on increased productivity with the HP LaserJet Pro M281fdw all-in-one color laser printer, featuring copy, scan, fax, fastest in-class 2-sided printing speed and First Page Out Time. Insert your USB device to view and print business documents right at the printer using the 2.7" color touch screen. HP wireless pro printer syncs to your existing Wi-Fi network for easy wireless connectivity. LaserJet Pro wireless color laser printer features fastest in-class first page out and two-sided printing, plus scan, copy, fax and wireless, as well as an auto document feeder, USB port and 2.7" color touch screen – meeting the demand of business class users. Up to 22 pages per minute (ppm) for black and color, with 2-sided pages at speeds up to 13 pages per minute (ppm) for black and color and first page out as quickly 10.3 seconds for black and 11.7 seconds for color. 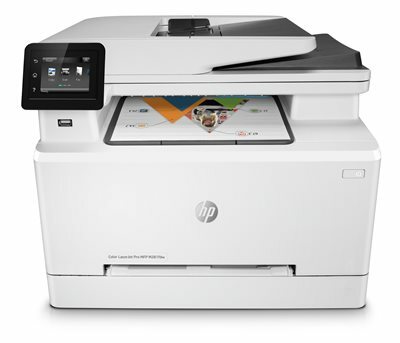 HP Smart app (separate download required) allows you to easily set up your printer, scan documents with your camera, and print directly from the cloud, such as Dropbox or Google™ Drive. Easily manage your print jobs with the 2.7" color graphic touch screen and the 3 control panel buttons including Home, Help, and Back. Compatible with paper (bond, brochure, colored, glossy, heavy, letterhead, light, photo, plain, preprinted, prepunched, recycled and rough), transparencies, labels, envelopes and cardstock. Media Size Oficio - 8.50" x 12.99"; A5R - 8.27" x 9.76"; B5 (JIS) - 7.17" x 10.12"; Executive - 7.25" x 10.50"; Photo - 4" x 6"; B6 (JIS) - 5.04" x 7.17"; DL Envelope - 4.30" x 8.60"; A6 - 4.10" x 5.80"; 16K - 7.76" x 10.75"; A5 - 5.80" x 8.30"; A4 - 8.30" x 11.70"; Legal - 8.50" x 14"; B5 - 6.90" x 9.80"; Postcard - 3.92" x 5.80"; C5 Envelope - 3.37" x 9"